It’s back…and this year Baltimore Ravens kicker Justin Tucker will be in attendance. 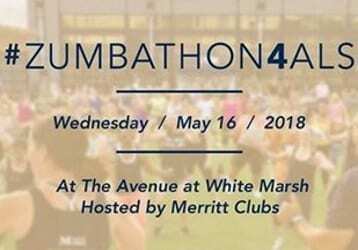 The 2018 #Zumbathon4ALS, hosted by Merritt Clubs at The Avenue at White Marsh will be held on Wednesday, May 16, 2018. The event will be held rain or shine (within reason) and all proceeds will benefit Brigance Brigade Foundation’s fight against ALS. There will be 90 minutes of Zumba, led by Merritt Clubs’ instructors. Class begins at 6:30 p.m., but guests are encouraged to arrive early. There will be no refunds given, and no exchanges for this charity event.